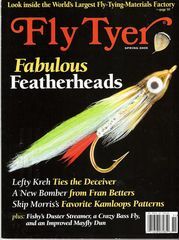 Fly Tyer is a great magazine and every serious fly tyer should subscribe to it. 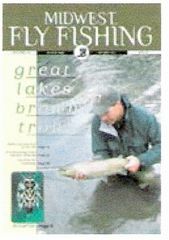 Each issue contains new fly tying tips and techniques that will make you a better fly tyer along with a number of fly patterns accompanied by their recipes and step-by-step photo enhanced instructions. 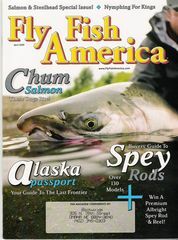 Americn Angler Magazine is the companion to Fly Tyer. In each issue you will find interesting articles on warmwater fly fishing along with a Warmwater Column, a Fly Tyer Column, and a casting column, among others. 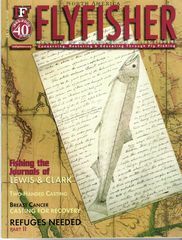 The Fly Fisher Magazine is the official publication of The Federation of Fly Fishers. 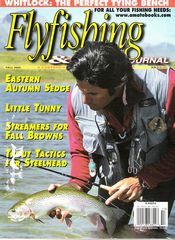 Every fly fisherman should be a member not only to receive this magazine but because the organization is dedicated to conserving and restoring our fly fishing resources and educating the public about our wonderful sport. 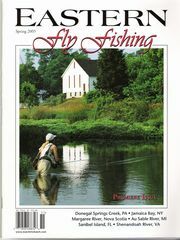 Each issue contains the "At The Vice" column that provides instruction for tying a particular fly pattern. Each issue also contains the "Fly Box" department -- a full color page of several fly patterns, many that could be used to take warmwater species. Even though this magazine is slanted toward the coldwater angler each issue contains some great information for the warmwater folks. For instance, in the Fall 2005 issue, there was a great article on The Perfect Fly Tying Bench by Dave Whitlock and an excellent photo enhanced article with tying instructions for creating balsa wood pencil poppers. This magazine's basic focus is trout and steelhead fishing in the Midwest but it does have a great Warmwater Fly Fishing column by Tim Holshlag. This relatively new magazine features articles on fly fishing for most fish species in the eastern United States from the Mississippi River to the Atlantic Coast. Smallmouth articles appear frequently. Each article stresses the flies used and in some cases how to tie them. 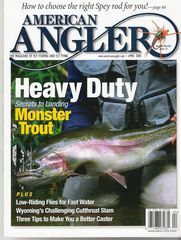 This magazine is yours at no cost by asking your local fly shop for a copy. Most shops receive a number of copies each month to share with thier customers. Warmwater flies and fishing articles appear frequently.